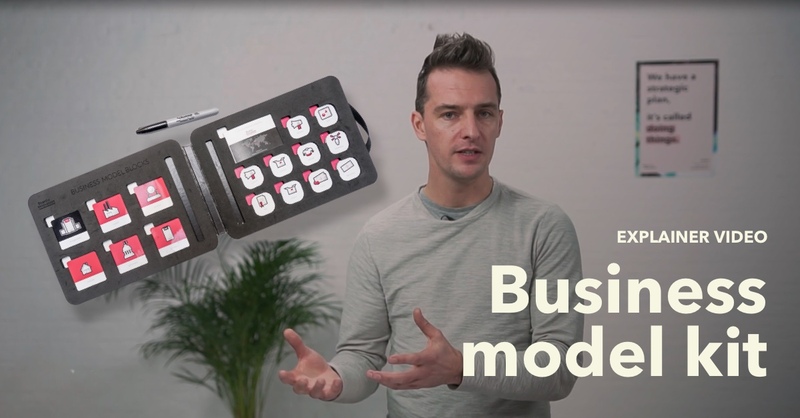 The business model kit is a tool designed to explore and imagine different business models to support your solution. The key to a sustainable business model is ensuring that all stakeholders in the ecosystem are delivering and capturing items of value. Why should we use the business model kit? Excel is not the most engaging innovation tool, isn’t? Discussions on business models often end up in total confusion. You’re talking about multiple revenue streams, tens of partners and many transactions going back and forth: it’s hard to keep all information in your own mind, and even harder is to communicate own ideas with the team. That’s why we developed a visual tool that helps to ideate and refine business models, correct existing issues, and communicate the outcome to other teams in a simple way. Perfect for individual and team brainstorms about new business ideas, it creates clarity on value streams and stakeholders. What’s the difference between the business model kit and the business model canvas? For those who are familiar with the business model canvas by Alex Osterwalder, our business model kit works in perfect harmony. The business model kit helps to ideate multiple business model options. In particular, it raises awareness over the value exchange between stakeholders. The business model canvas is a perfect screenshot of an existing, established business model. We suggest to use it after the business model kit. Be sure to check out our business model examples and info on how to use them. How to use the business model kit? When to use the Business Model Kit? When teams are still exploring monetization options and partnerships. To align a team on how the ecosystem around an idea might look like. To set up different revenue models to compare during brainstorm sessions. To present your business model to a large group. Best when past problem-fit gate or when pivots are needed later in the process. Get a physical or digital version of the business model kit and meet with the team (prep). Position yourself as a separate start-up and depict your organization as a client or supplier (5 min). Map out all the different stakeholders (10 min). Map out different value exchanges between stakeholders (20 min). Ensure that your model is sustainable by checking if each stakeholder gives and receives something (10 min). Challenge each stakeholder and transaction and try to imagine alternative business models or revenue streams (15 min). Tip: Be specific and name every stakeholder and value exchange. Tip: Only draw orthogonal lines between stakeholders to ensure a clear visual representation of the business model. 6 stakeholders and 10 value-exchange elements to visualize your business model. Using a common, visual language enables you to easily communicate business models to different audiences, to learn from successful models in other industries, and to quickly generate new variations and business models of the future. The 6 stakeholders represent the organizations/group of people/consumers between which the value exchange happens. The 10 value elements represent 10 major types of value that humans can exchange between each other. This is where your business model starts to get a shape. Place this block in the center and build your model around it. The second most important block is the company. In most models, this will be the actor that offers a product/service. In B2B models, the company is the client and will, therefore, be illustrated with this icon. The one that receives the product and gives something in return, is the consumer. The general company-client relation is the same in both B2B & B2C business systems. Although we prefer not to include much of the secondary stakeholders, sometimes it’s relevant to show how the supplier side of a business system works. This icon can also be used for service suppliers. Unions or charity organizations are not focused on making money but often they do have an impact on your organization. If relevant you can add this player to the system. Many companies do not like the involvement of a government in their business model, except when they have some money to offer. The first, most straightforward offer to clients is an actual product, ranging from basic commodities up to finished goods. A BMW car is one example, but today also digital products can be included. A first way to upgrade your business model is to offer a service next to the product. BMW, in this case, will not only sell you a car but will include maintenance and other services around the product. Of course, a lot of companies offer only services without product. The two concepts of product and service are commonly applied throughout our economy. In the last years, several companies have moved a step further by offering an experience to customers. BMW does not sell a car with a service in this case, but a driving experience. The typical currency that clients pay with, is money – which is critical to a company’s revenue models. This is in contrast to exchange. The blocks make a differentiation between two types of money. This first icon represents the normal value of a good, including profit. This second icon represents money as well, but less than the normal amount covering the cost and profit of what is offered. Usually, this transaction implies that other revenue streams are added to the traditional business model. (Virtual) credit systems are on the rise. Therefore we have to add them to the business model blocks as well. Loyalty cards and similar are also covered. Information is one of the key items that’s being transferred in modern business models. Depending on the context a mixture of ‘information’ related items (content, data, knowledge, articles,..) are being used in relation to this block. Ownership rights, IP and even the right to emit CO2 are items that stakeholders can exchange between each other. This must be the most abstract block but is necessary to illustrate the innovativeness of several models. Today, the next upgrade to reputation can only be found in a few sectors. In these cases, ‘reputation’ selling can be described as the essential brand experience. Typically, reputation will be placed at the top of Maslow’s hierarchy of needs, which makes this type of transaction extremely valuable to companies. If you take the example of BMW, then you could say that some people don’t see their BMW as a driving experience but as the core values and reputation of the brand as such. Hereby, customers are able to shape their own identity with that of the company. Active exposure or attention is the next step in the evolution of currency. People are not only offering their own attention, but also that of their peers in their social environment. For some businesses, the spreading of their ideas and brand values becomes more important than the immediate return in money. Of course, companies can’t just rely on active exposure, so their business model should include more players and other transactions. Many start-ups and even big web 2.0 companies are still struggling with this. There is a lot of exposure and value offered to clients, but there is no sustainable business model to capture that value in revenues and profit.